Vintage From Paul is pleased to offer these pristine condition Sterling China Vitrified Green Stripe Restaurant Dinner Plates. The Sterling China Vitrified Green Stripe Restaurant Dinner Plates have a white body decorated at the rim with one larger & one smaller green stripe. The inner verge has a smaller green stripe. The bottom of the Sterling China Vitrified Green Stripe Restaurant Dinner Platesshows the stamp of the Sterling China Co., E. Liverpool, Ohio. 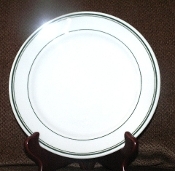 The Sterling China Vitrified Green Stripe Restaurant Dinner Plates measures 9-1/8 inches in diameter. Each available Sterling China Vitrified Green Stripe Restaurant Dinner Plate is in pristine condition showing no signs of previous use.